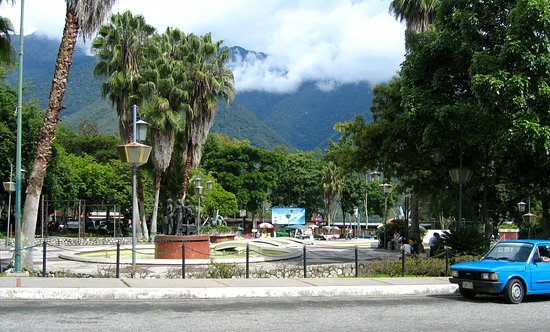 Mérida is located on a table of land between two mountain ranges and national parks. The Sierra Nevada range is to the east, and the Sierra de la Culata is to the west. It is home of one of Venezuela's largest universities, the Universidad de los Andes, and is a popular tourist attraction which explained why we were there. Mérida was founded in 1558 and grew up around its Plaza Bolívar, which I suspect had a different name in those days since Simón didn't become popular until the late 1700's. The town was not founded without a healthy dose of bureaucratic hassling. 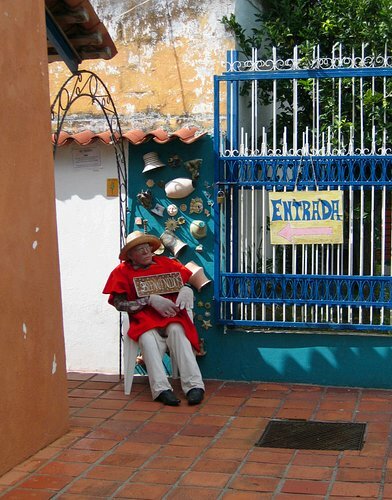 A town of Mérida was founded by an officer, Juan Rodríguez Suárez, about 25 kilometers southwest of the present city. Of course, towns at that time could only be founded by royal proclamation from the royals back in Spain. Juan found himself tried and convicted as a criminal and sentenced to death. How come we don't do that to real estate developers these days? Anyway, sympathizers hid Juan in the town of Trujillo and he was eventually granted political asylum -- the first of of the New World. Hostile indians forced the movement of the original setters out of the original location of Mérida (near the present day town of Lagunillas). 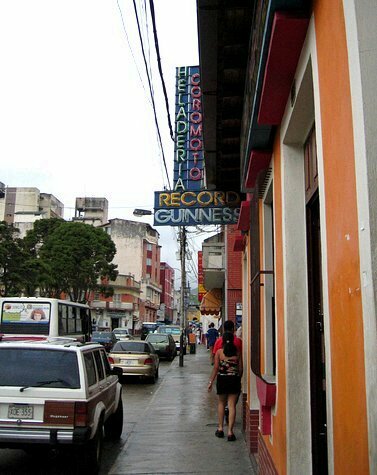 Eventually the town was established in its present location and was given the name of La Ciudad de Santiago de los Caballeros de Mérida, essentially "The Gentlemen's City", by Juan Maldonado y Ordóñez who just happened to be the man that originally arrested Juan Rodríguez Suárez. The plaza is a bustling center that attracts artisans hawking their wares during the day and flocks of young couples in the evening. My GPS tracks say that we drove around it, but did not stop. There was a lot of traffic and people and we were in the process of driving around trying to figure out where we were going, so we just plain missed it. Oh yeah. It was raining too. The tastiest stop we made was at the Heladería Coromoto ice cream shop. 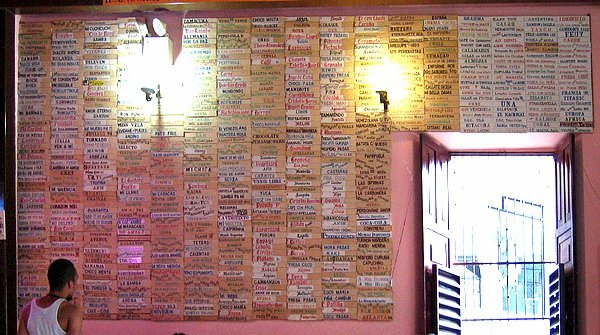 In 1991 Manuel Da Silva Oliveira's shop made it into the Guinness Book of World Records by sporting a menu of over 500 flavors of ice cream. Amor eterno, samba, tornado, pato frio, Miss Venezuela, la carbonera, el vegetariano, brama, avacado, Titanic, salmon, tuna...you name it and it was probably a flavor. For obvious reasons only about 60 flavors are for sale at any one time. I think I had a vanilla cone. There was a little cable car system in Mérida. 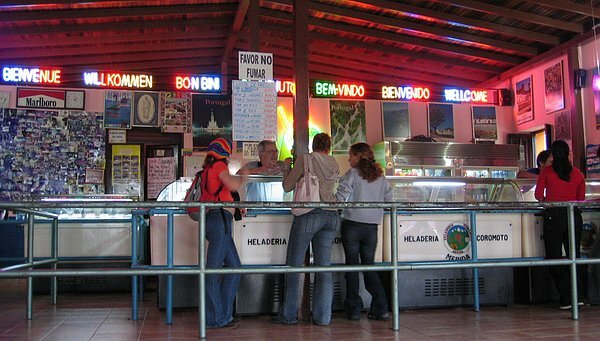 The area around the teleférico station and the Parque Las Heroinas was quiet with many little shops and restaurants. Even the statues were relaxed.